Hi Friends! I have so many thoughts swirling in my mind... all things I want to share with you! BUT... not today. I want to flesh out the ideas a bit more before I do. I do, however, want to give you a bit of insight on my earnings and expenditures today, to hopefully give you a bit of inspiration! As of this morning, our fridge was pretty bare. I wondered what in the world Jeff and I were going to pack for our lunches. I was momentarily tempted to give in and buy a sandwich from the sandwich van that pulls up blaring its music like an ice cream van and parks itself dutifully at 11:45 outside my office window daily. The salads and sandwiches that my colleagues buy from the sandwich van look good and, boy, would it be easy to buy something every day... but two things: a) I don't want to spend money unnecessarily, b) I don't want to fall into the habit of thinking of the sandwich van as a backup "just in case"... it's simply not an option (ok, it is, but the very last option). Thankfully we had a few eggs, which I hard boiled, cut up and put on a couple of day-old rolls with a little mayo. We also had yogurt, a nectarine and a Kit-Kat each. Done. And no extra money spent. Phew! Dinner was a similar situation, since I wasn't planning to go grocery shopping until after dinner... sans kids. I had planned to make pasta carbonara, again using up a few more eggs, a few strips of bacon and a handful of frozen peas, but then my daughter, Ellen, asked if we could have tuna pasta bake instead. Sure! Thankfully, we had 4 tins of tuna in the cupboard; I used 2. I also chopped up the remaining couple of carrots in the fridge that were starting to shrivel. So, I made a complete meal with some cupboard staples and used up a couple of carrots that may have ended up in the bin in a few days had they not been used today. After dinner, with my grocery list app in hand, I headed to Aldi. I kept to my list for the most part and spent about £40 to fill up our fridge. I splurged on a large pack of strawberries at £2.39, but these will be a side dish of sorts to have with hamburgers, so in my opinion, they're worth the extra expense. I don't really follow economics, but I'm amazed at how much a normal pack (250g) of butter has sky rocketed the past 6 months or so. I'm not entirely sure why the cost of butter has gone up as much as it has, I just know it has. On the way home, I dropped off a Christmas teddy bear to someone who couldn't collect it - I only agreed to drop it off because I was about 3 minutes from her house when I was at Aldi. Another £2 added to my kids' university savings fund. (Another blog post in the works!) I also swung by the Tesco petrol station to use a 10p off per litre of fuel voucher I received when I did a big shop at Tesco a couple of weeks ago which expires tomorrow. Definitely wanted to take advantage of that! 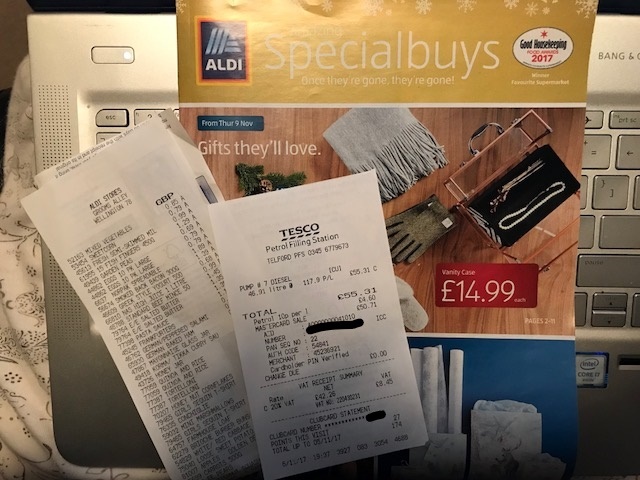 Using the voucher saved me £4.60. We have another one to use by next week for Jeff's car. I went this evening rather than making an extra trip out tomorrow evening... that's a small savings, right?! I'm planning to write more of these "How I Spent My Day" blog posts. I'd love to know what you think of them and whether they inspire you to think about your pennies in a different way.